Magritte's title calls to mind the basic elements of the universe---air, water, fire, and earth---although the connection between these and the images in the painting remains mysterious. Painted at the end of a three-year stay in Paris, during which Magritte became a full-fledged Surrealist, The Six Elements exemplifies the artist's ability to lure viewers into questioning the relationship between language and image, the rational and the irrational. Using perplexing juxtapositions and distortions of commonplace objects and painting in a smooth, illusionistic manner not typically associated with modernist experimentation, Belgian Surrealist René Magritte set out to disturb existing assumptions about rationality and the perception of reality. In The Six Elements, he used his deadpan approach to create a multi-paneled picture within a picture, showing six components--flames, a female torso, a forest, a building facade, clouds in the sky, and a curtain made of lead and sleigh bells--separated by an irregularly shaped painted frame. The title calls to mind the classic formulation of the basic elements of the universe--earth, water, air, and fire--but the links between these and Magritte's set are elusive, presenting teasing riddles for the viewer. Although each element is presented in isolation, the painting, which as two-dimensional as a theater set, calls into question the notion that reality can be divided into separate components and easily subjected to rational analysis. Painted at the end of a three-year stay in Paris, The Six Elements exemplifies the artist's ability to challenge the viewer to search beneath the surface of his flat and enigmatic paintings. Emily Hage, from Masterpieces from the Philadelphia Museum of Art: Impressionism and Modern Art (2007), p. 182. Magritte developed his art from the troubling uncertainties produced by strange juxtapositions and distortions of commonplace objects and settings. His style of painting in a smooth, illusionistic manner more commonly associated with academic or popular art than with modernist experimentation was an essential tool in the artist's lifelong project of disturbing existing assumptions about the rationality of reality and its perception by the eyes and mind. In The Six Elements, he relied on this direct style of representation to depict a multipaneled picture-within-a-picture showing six components: flames, a female torso, a forest, the facade of a house, a sky with clouds, and a curtain made of lead and sleigh bells, one of his favorite enigmatic images. Magritte's title calls to mind the classic formulation of the basic elements of the universe—air, water, fire, and earth—although the links between these and his own set are elusive, presenting teasing riddles for the viewer. Each of the elements enclosed in the framed compartments assumes a quality of isolation as if it were a discrete thought or a word. Yet the image, which seems as easily toppled as a theater set, calls into question the notion that reality can be divided into parts and subjected to rational analyses. 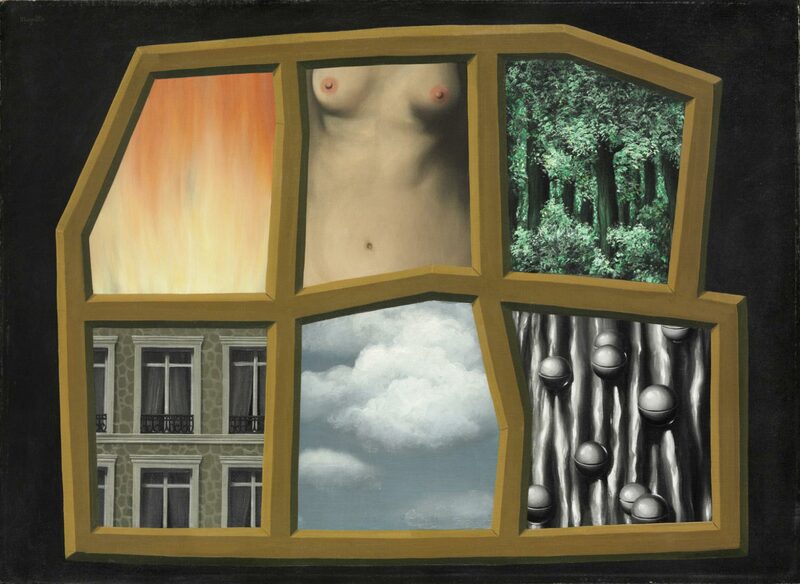 Reused and transformed by the artist in later paintings, these same "six elements" became central to the self-contained world of Magritte's art. Painted at the end of a three-year stay in Paris when Magritte was immersed in Surrealist circles, The Six Elements exemplifies the artist's ability to lure the viewer into questioning the relationship between language and images and searching for meaning behind and beyond his flat and seemingly intractable paintings. Twentieth Century Painting and Sculpture in the Philadelphia Museum of Art (2000), p. 69. André Breton (1896-1966), Paris; sold to Louise and Walter C. Arensberg, Los Angeles, through Marcel Duchamp as agent, 1937 ; gift to PMA, 1950. 1. See Duchamp's provenance notes date September 8, 1951 (PMA, Arensberg Archives).